Can Israelis and Palestinians find common ground on the Jerusalem question? 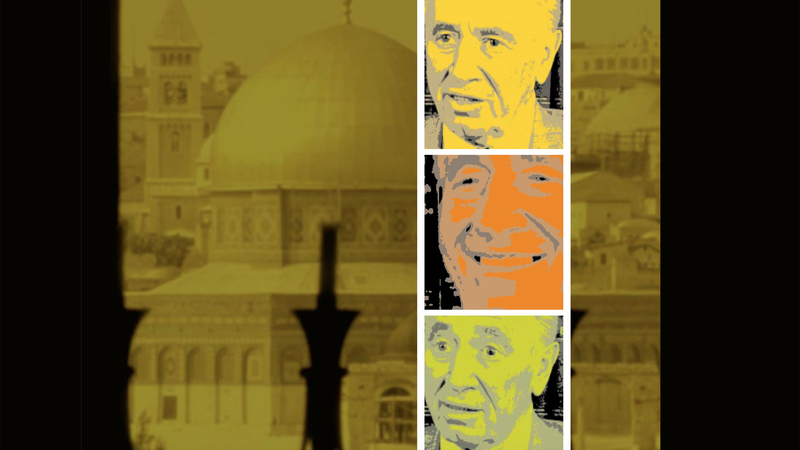 Vision publisher David Hulme interviews Shimon Peres. The issue of Jerusalem’s immediate future is bound up in the final status negotiations between the Israeli government and the Palestine Liberation Organization. The latest and most promising attempt to put an end to the half century of Israeli-Palestinian hostilities has reached a critical juncture. Not surprisingly, negotiators have saved the most difficult questions till last. There are four issues that must be resolved before peace can be secured. They are: the right of return for Palestinian refugees; the borders of Israel and the future Palestinian state; the West Bank Israeli settlements; and the final status of the city of Jerusalem. For most in Israeli political leadership the unified city is nonnegotiable, no matter the administration—Labor or Likud. The Palestinian position is that East Jerusalem must be the capital of their new state, under international, binational or singular Palestinian sovereignty. The United Nations prescription for peace is based in part on its 1947 resolution, which assigned the Old City of Jerusalem the status of corpus separatum, an independent city separate from either the Israeli or the Palestinian state, governed by a UN-appointed official. Later UN resolutions added the requirement of a return to the borders of the city prior to the 1967 Arab-Israeli War. The matter of access for religious adherents and visitors to Jerusalem’s holy places adds a complicating factor to the already convoluted situation. Representatives of the main religious groups will continue to seek to preserve their rights of access and freedom of worship. As this issue of Vision goes to press, PLO chairman Yasser Arafat and Israeli prime minister Ehud Barak, reminiscent of finalists in a televised ballroom dancing championship, are engaged in some elaborate political footwork for the entire world to see. They both have everything to lose by a misstep in their choreography. The questions surrounding Jerusalem loom large. The volatile mixture of politics, religion, ideology and myth promises continuing headlines. Perhaps only the words of Israel’s most famous king, David, point the way ahead. He wrote in the book of Psalms 3,000 years ago, “Pray for the peace of Jerusalem: ‘May they prosper who love you. Peace be within your walls, prosperity within your palaces’” (Psalm 122:6–7). A modern-day Israelite familiar with the complexities of the final status negotiations is former Israeli prime minister Shimon Peres. In the following interview with Vision, he made a number of prescient and unexpected remarks. DH It could be said that successive Israeli governments have based their position on Jerusalem as the eternal and undivided capital of Israel primarily on a Zionist ideological viewpoint, and that as such, the city has formed a very important part of the Israeli identity. Would you comment on that? SP It’s not just ideology. It’s also history. Historically, Jerusalem was never an Arab capital. Even when the Jordanians occupied East Jerusalem, they never made it the capital. On the other hand, as far as Jewish history is concerned, we didn’t have any other capital but Jerusalem. So it’s almost normal that we should look upon Jerusalem as our center of prayers, of hopes, and of administration at the same time. Things are a little bit more complicated when it comes to the religious (not the political) side. Religiously, there are at least three major religions—Jewish, Christian, Muslim—and maybe it is here that we have to look for some new approaches. It looks to me like Jerusalem is closed politically but open religiously, and the claims of the Arabs and the Palestinians are more religious than political. You know, one day Arafat told me he would like to have a sort of Muslim Vatican in Jerusalem. I asked him who would be the “pope” in that case. I’m not sure we got the ready-made answer, but anyway, he chose a certain direction. DH Would it be fair to characterize the difference between the Palestinian Authority and the Israeli government position on Jerusalem as ideological? Don’t both want sovereignty over the same area? SP Yes. There was a slight change in the Palestinian approach, because they claim today they are not for the division of Jerusalem. They want Jerusalem to remain one city—one city but two capitals. I hardly can see at the end of the 20th century somebody making a new Berlin in the Middle East. We’ve had a divided Berlin; nobody wants to have a divided Jerusalem. In the beginning it looks like a solution, but later on it will become like the greatest problem that all of us will face. DH If it is ideological in nature, and both want the same thing, how do you go about solving or negotiating away an ideological impasse? SP In my own experience, whenever you had two solutions, neither of them could prevail. It was the arrival of a third solution, which had the nature of creativity, that won the day. In my experience, all known solutions are dead solutions. If you want to kill a solution, announce it. Then you will mobilize an opposition and skepticism, and you will kill it. DH To what degree are security concerns an issue in the Jerusalem question? SP Security is clearly an issue, but maybe here I shall be a little bit different from many of my friends. I believe that the answer to security is better relations and not better fences. We have to be honest with ourselves. Israel, in my judgment, will never enjoy 100 percent security unless our partners enjoy 100 percent freedom. You cannot have a full security against a partial freedom, and we have to understand that, and we have to tell the truth to ourselves. I think it is a golden occasion to build new relations instead of building new lines; but we are so occupied, all of us, with geography, topography, strategy, walls, fortifications, that we overlook the possibility that all those are not needed once we change the rapport between the Palestinians and ourselves. And maybe both people are by far more ready than the traditional leaders are realizing and declaring. DH Is there an economic interest at stake in Jerusalem’s future? SP Jerusalem, like Israel, like Jordan, like the Palestinians, must become an open economy. I mean, whoever wants to have something national, he can have national poverty, not a national economy. In our meetings with a group of Arab leaders, they told me, “Look, you want to dominate our economy.” Please, be more serious. We don’t have economies, we have poverties. Who wants, today, to control the poverty of another nation? Would Great Britain today return to Bangladesh? To India? You will look for new inventions, you will look for new technologies, for new science, and you will look at it with an Internet that doesn’t have borders or distances or closeness. DH In the book about the peace process by Uri Savir, he quotes you as saying to him, “Above all, the Palestinians must agree that Jerusalem will not be included in any autonomy arrangement; otherwise, further progress will be impossible.” Why did you approach the issue that way at that time? SP I always thought that when you want to achieve something political, the first distinction you have to make is between mobile and immobile parts. If you want to have a nonstarter, begin with the immobile parts. If you want to move, identify—where can you move? You cannot walk on a chasm, but you can walk on a street; and I thought, if you start with Jerusalem, you will kill the chance to negotiate. You immediately sow disagreements, mobilizing everybody who has any extreme inclination in his blood system. So I thought, just a minute—let’s first of all change the climate, and then we shall tackle the issue under a different sort of a feeling and appreciation. DH A couple of years later, in 1995, you said that Jerusalem would remain Israel’s united capital in perpetuity. Is that a position that you think cannot ever change? SP Furthermore, I think there is no need to change it. I can think of so many other alternatives—why touch this one? You know, Jerusalem may be the only issue on the Israeli position which escapes strategy and politics. This is the only place that has the aura of holiness. And the difference between politics and holiness is that when holiness begins, compromise stops. Even reason stops. If somebody says it is holy, that’s the end of reason. DH There was an article in the Jerusalem Post on June 18, 1999, about a new book by Menahem Klein of Bar-Ilan (Doves Over Jerusalem, Jerusalem Institute for Israel Studies, 1999), in which he speculates that the Temple Mount may be made extraterritorial and that one day we may see a Palestinian flag flying above it. SP That’s an unclear idea. According to our tradition the Jewish people should not be on the Temple Mount before the Messiah comes. (You know, the Messiah is the greatest diplomat the Jewish people have ever had, simply because He hasn’t arrived yet.) So I don’t know exactly to which proposition he is referring. DH Is the Israeli identity undergoing a major shift? The reason I ask that question is that there is a new book in the United States, which speaks to the fact that this identity must change for a new world. SP In a strange way, I think we are returning to be more Jewish in the real sense of being Jewish. Judaism (we don’t admit it) was very much affected by the Diaspora, by our living there, and it has many elements of copying other religions. What do I mean by it? Judaism was never a church, always a faith; it didn’t have any hierarchies; they didn’t have anybody who was nominated by the Lord to give orders to other people. Your connection with the Lord is direct, and what made Judaism so special is the idea that every person was born in the image of the Lord. So nobody is superior or inferior. If the rabbis want to decide who is a Jew, the Jews have the right to decide who is a rabbi. It’s equal. And now there is a strong tendency that we should escape the attempt to build a Jewish church. We don’t have churches, we have streams; we have differences. According to our tradition, the Torah—the gospel—has 70 different faces, and nobody can decide that one is higher or better or stronger than the other. We have to live with our differences—and at the same time with our equality. DH I suppose some people would say that you are a new kind of Israeli—perhaps they would say you are a master of realpolitik, willing to compromise with enemies who might possibly become friends. Is that an accurate characterization, and do you think that you, personally, have changed over the years in your approach to these kinds of issues? SP Let me start with the last question. I have changed because the situation has changed. When I thought that Israel was in danger, I was a terrible hawk. I thought it my duty to do whatever I could to defend Israel to make it stronger. But that wasn’t a purpose; this was a must. Once I felt that we could go for peace, I changed, because that is a purpose. War is a must, peace is a goal, and I don’t hesitate to admit it—full-heartedly. Now I think that, if I can say something good or bad about myself, I’m more in love with the future than anchored in the past. You know, they say the Jewish people have a long memory. What we need is a rich imagination today, because the things that are going to happen—or did happen already—are so revolutionary that the past becomes pale—irrelevant. Today I would be very reluctant to teach my children history. What is history, after all? A chain of wars, of bloodshed, of hatred, of generals. The whole history was written with red ink. I don’t say that our fathers and forefathers were terrible people, but they used to live in a different world—in a world where nations and tribes and individuals made their life from land and natural resources. So they had to defend it or to extend it; they needed borders and armies, and occasionally they went to war. Today, when your wealth stems from ideas, from science and technology, why do you need borders? You cannot afford them anyway. What do you need wars for? I think that I am looking not at the future, I am looking at the present, and I see the call of the future. I see before my eyes a changing world—a revolutionary one. I shall always remember walking on Fifth Avenue on a spring day in New York. I saw a beggar who was blind, and he had a placard before him: “There is spring in town, and I am blind.” My feeling is, there is spring in town, and we are blind. My own suggestion is to open the eyes—nothing wrong with spring. DH So you’re optimistic about the future of Jerusalem? SP Yes. I think, in spite of the mountains of difficulties, and oceans, really, of suspicion, somewhere there is a hidden solution between not forcing Israel to depart from her initial orientation and taking into account the Muslim needs, religious and otherwise. DH In my meetings in the last few days with the Palestinians that I have met, a number of them talk about exactly what you’re talking about. They are very optimistic about things, particularly in reference to the things you’ve been doing. Your name comes up a lot. The Peres Center for Peace comes up a lot. Now, it may be that it’s just that I’m talking to a certain group of Palestinians. SP No, I think that my words have an echo because that’s what they need. It’s not my personality but their destiny that creates so much interest. What I’m saying, really, to the Palestinians—and I’m saying it to ourselves—for the sake of Israel being democratic and Jewish, we need a Palestinian state. Not just a Palestinian state, but a democratic Palestinian state. Not just a democratic Palestinian state, but an affluent Palestinian state. We must be very careful that they will not be controlled by us; neither will they be submitted to poverty. If they will be poor and we shall be rich, the economic difference may all of a sudden burst out as another conflict. So what we have to do, sincerely, is to help them to arrive at the shores of democracy. The Palestinians are a highly intelligent people, and they may well become the first real democratic experience in their own world. And we have to help them to build a high technology. You know, even if we shall give them whatever they really want, still they won’t have much land and we won’t have much land. We shall have to make—them and us—our life from our brains, and we’d better work on the brains. You cannot extend the land, but there is no reason to limit your brains; and, I think, if we shall do it, we shall behave wisely. From our point of view, the better the Palestinians shall have it, the better a neighbor we shall have. This interview has been edited for length and clarity. It first appeared in the Winter 2000 issue.